I dread the idea of carving a pumpkin at Halloween. It’s messy and they never turn out how I want. I found a new way to decorate a pumpkin easily! No carve pumpkin decorations is WAY easier than trying to carve a real pumpkin. I found this in a magazine from years ago and it has been such an easy, no-fuss and fun way to decorate pumpkins. In a ventilated area, cover floor with newspaper. Spray-paint pumpkin black and let it dry. 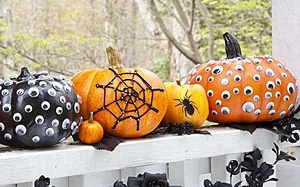 Put the googly eyes all over pumpkin. Use glue to secure eyes if adhesive doesn’t hold. Get Colored Glue and make a spider web on the pumpkin! See these web stencils. Pick up spider stickers or other creepy stickers and decorate the pumpkin. Or use a stencil of a spider and spray-paint a spider on the pumpkin.